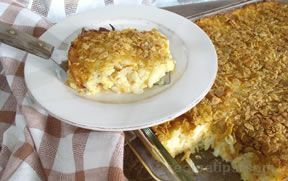 This cheesy potato casserole is dressed up with bacon and two kinds of cheese for a dish that will take care of any hungry appetite. These tasty potatoes make a perfect side to any main course but go especially well with anything off the grill. Preheat oven to 350 degrees F.; grease the bottom and sides of the baking dish. Cut baked potatoes into 1" cubes. Spread half of the cubed potatoes in the bottom of the prepared baking dish. Sprinkle the potatoes with half of the salt, pepper and bacon. Add half of the sour cream on top and carefully spread out evenly. Sprinkle half of the cheeses over the sour cream. Repeat all of the layers. 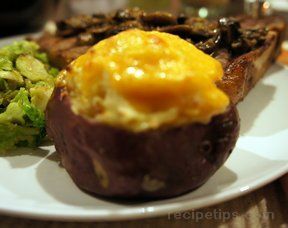 Place in the preheated oven and bake, uncovered, for 30 to 45 minutes or until the cheese is melted and nicely browned. 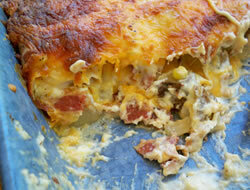 "Potatoes, bacon, and cheese . . . what more could you ask for? 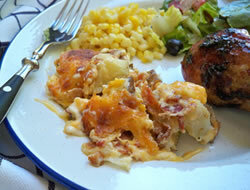 This was an excellent potato casserole."